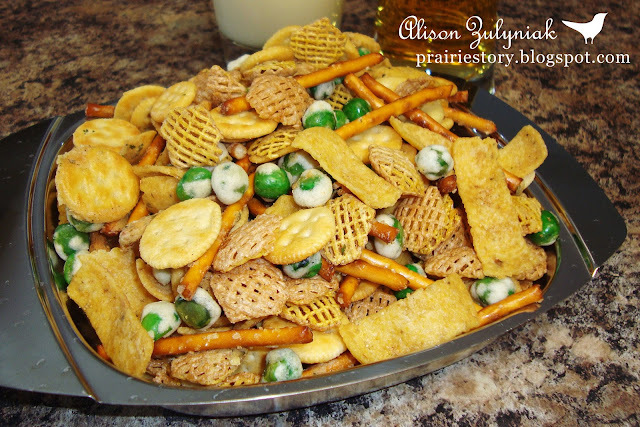 Here's a great little snack for a New Year's Party! This is Nuts & Bolts kicked up with some heat! It is highly addictive. - Mix first 5 ingredients together in roaster. - Pour melted margarine over and mix/shake to coat. - Add the 2 packages of Ranch powder to the mixture. Shake to coat. - Bake @ 250° for 90 minutes. I LOVE this stuff! We used to pour Orville Reddinbacher butter topping over it before the ranch and add bagel chips and cheezits! So incredibly unhealthy but sooooooo good! Thanks! I will have to make a double batch of this recipe, my family will love it. Thank you for sharing and thank you for hosting us today. You and your family have a very happy New Year!